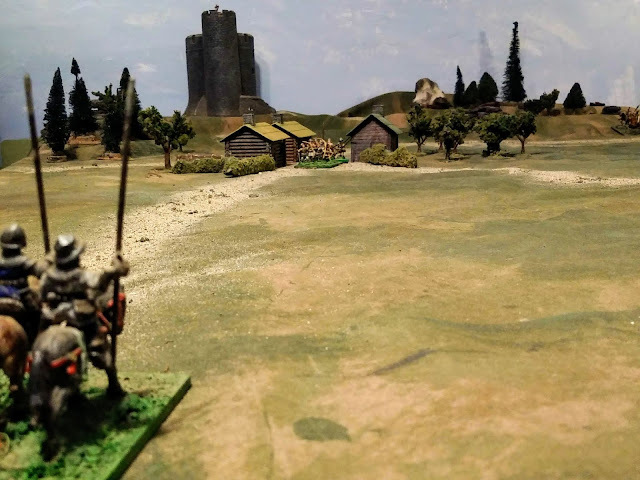 Many months had passed since Sir John of Raven's Wood Tower, Captain of the Pass, better known as the Black Knight, had led his men across the mountains to make a preemptive strike on the peaceful farmers of Dale. For months afterwards the Warden of the West March stood guard against retaliation but at last the danger seemed to have passed. The men of the North are patient and canny though. After a suitable delay, the three nations which make up the Federation all agreed to supply troops for a fast moving raid: Dalish lancers and light archers, Valdurian Light horse and foot and Herdsmen Horse Archers. Lord Bedewyr with Dalish Lancers and Herdsmen. The raiders blazed a trail of destruction from the East Pass across the West March to the Great Pass. If the Black Tower could not be passed then there was still a route home through the Forsaken Lands west of the mountains. As the raiders neared the mouth of the Great Pass though and saw the Earl's banners, it was clear that any passage would have to be paid in blood. The Earl swiftly deployed his men as the Northern horse archers rode forward to harass them. Arrows soon began to fill the air. At this point, a horn blew from the tower and the garrison sallied forth to bar the pass against the raiders that they could see approaching. To the North, the Valdurian contingent sped ahead, eager to get to grips. The cavalry were first, upholding their ferocious traditions. 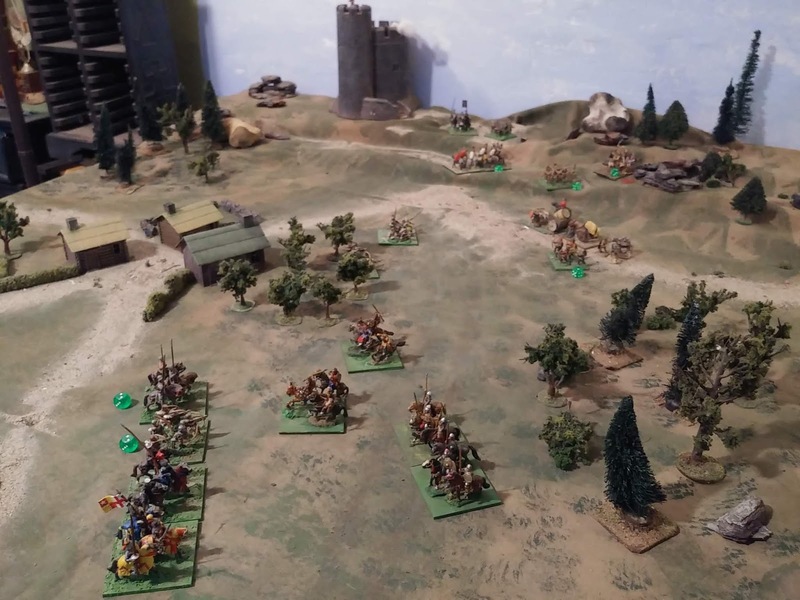 The Black Horsemen spurred forward but despite their armour they barely held the wild horsemen in check and as the lines closed again the Tower guardians were forced back with heavy losses with the mounted crossbowmen fleeing back to the Tower gates. At the sight of this triumph, the wild Valdurian tribesmen rushed forward from the rocky slopes of the pass, screaming and waving their swords as they charged. The Tower crossbowmen, veterans of many a skirmish and battle weren't rattled and after riddling the enemy with powerful bolts, drew their swords and braced their pavises. 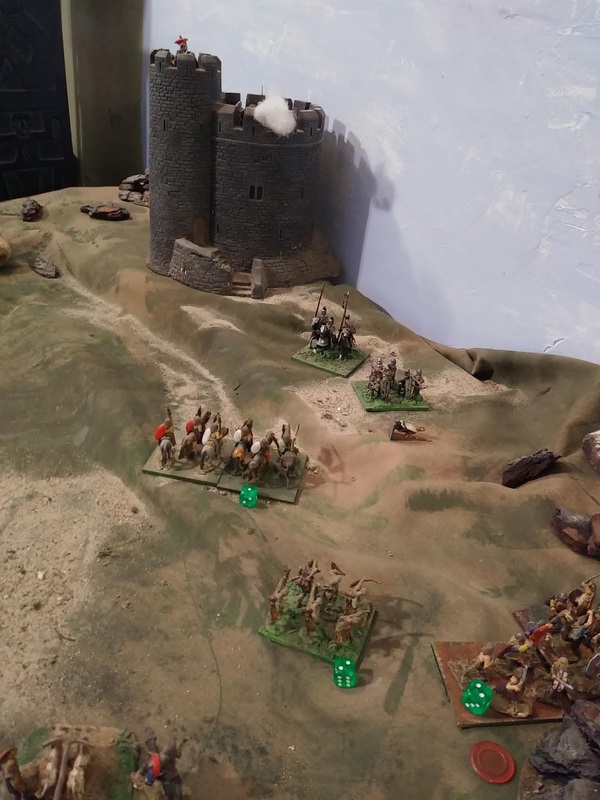 The shock of the impact could be heard across the valley but the veteran tower guards held firm, cutting down the unarmoured tribesmen. Their Chieftain, in a desperate attempt to break the shieldwall, threw himself upon it, struggling to seize and pull down a pavise until it was suddenly pulled aside and a pointblank crossbow bolt transfixed him. The shocked tribesmen turned and ran. 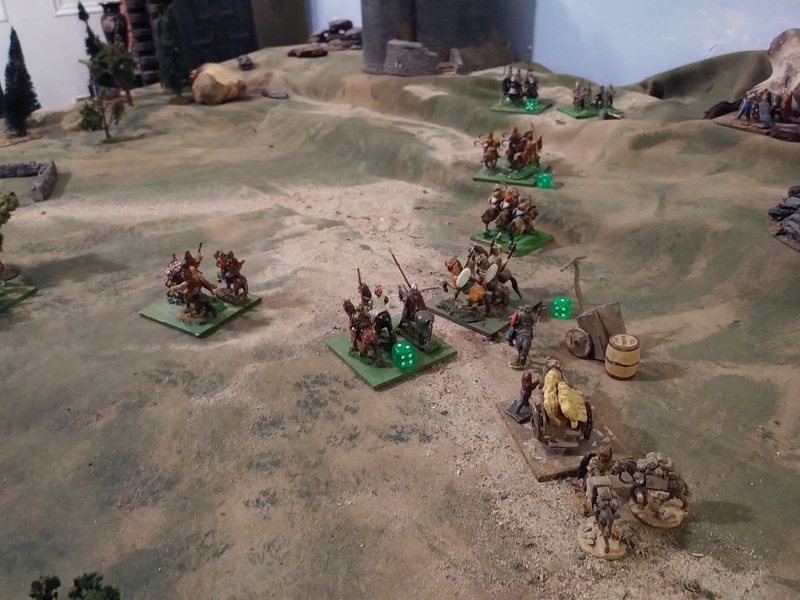 On the plain the Dalish lancers held back while the horse archers darted forward and back, striking the Midlish with devilish accuracy. The Earl knew he had one chance, the trumpets sounded along the line. Down came the lances as the heavy horse began to thunder forward but the Dalish lancers, fewer in numbers and lighter in armour, were every bit as bold. They spurred forward to meet them. Three times the lines came together while the horse archers darted in and out but at last the Midlish horse broke and rode for safety. The Duke pulled his men back and turned to go finish clearing the pass. As the Valdurian troops rallied, the convoy continued to advance, now under a heavy and increasingly accurate fire from the Great Gun mounted on the tower. 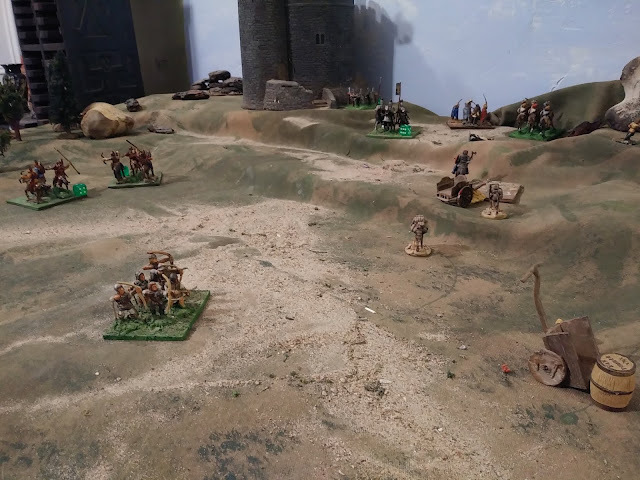 The convoy archers deployed and prepared to engage the pass defenders when the local levies suddenly emerged from the woods and town. These veteran frontiersmen were deadly shots while the canon added to the havoc. 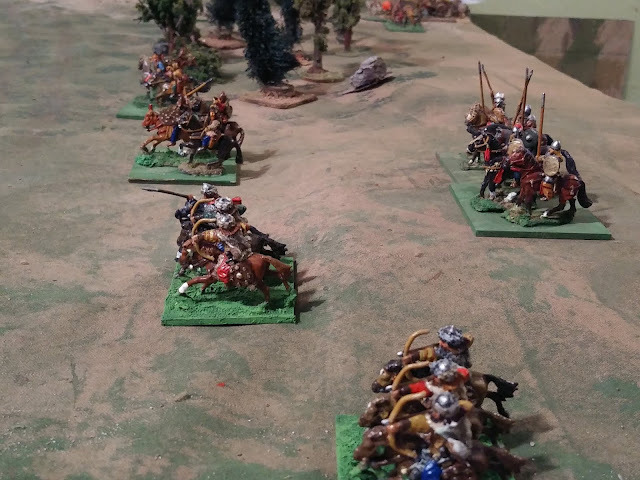 Under cover of the barrage, a small clump of spearmen led by Baron Robert advanced quickly on the convoy. Brushing aside the remaining archers they closed on the carts. The men driving the carts were Valdurian warriors though and put up a fierce fight. 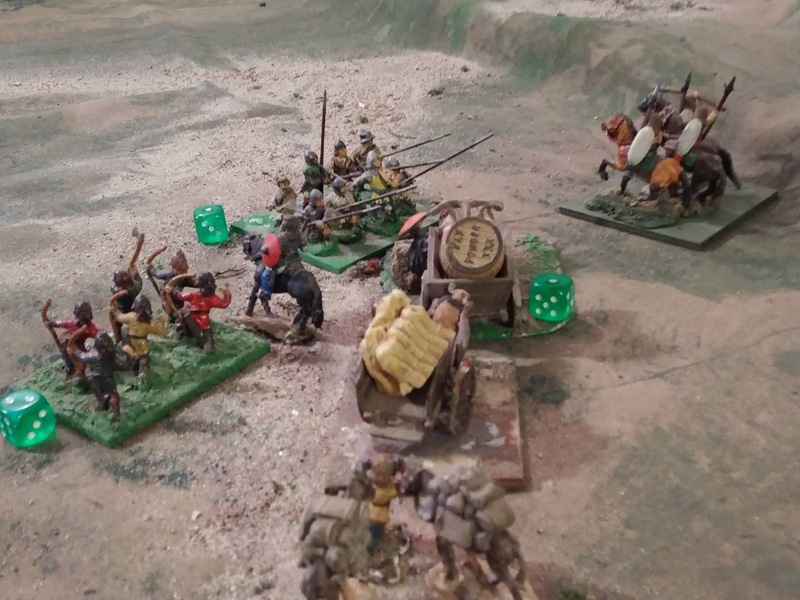 When the Valdurian cavalry joined them, the spearmen were first driven back then finally broken but damage had been done. 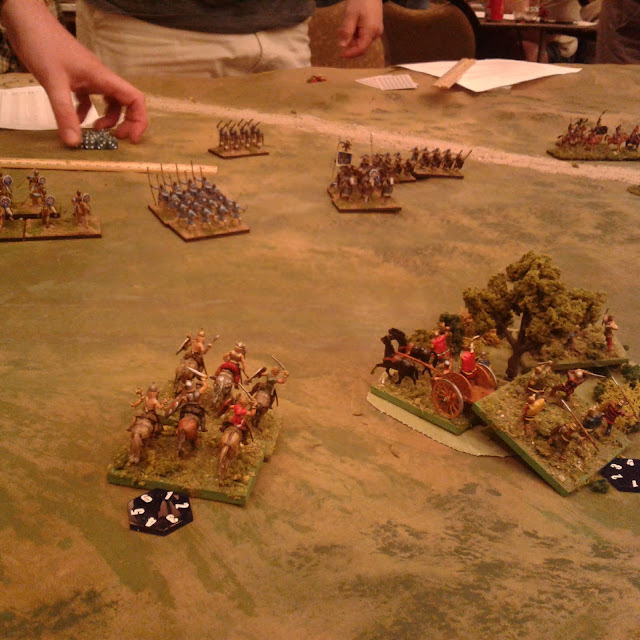 Losses had been heavy on both sides but the Federate cavalry was still in good shape. Against them stood only the Black Knight and his remaining handful of knights and crossbowmen. Cheered by the site of the proud Duke and the head of his Household Lancers, the Valdurian tribesmen were moved to rejoin the fray. Charging down from the rocks they caught the crossbows off guard and drove them fleeing back into the tower. 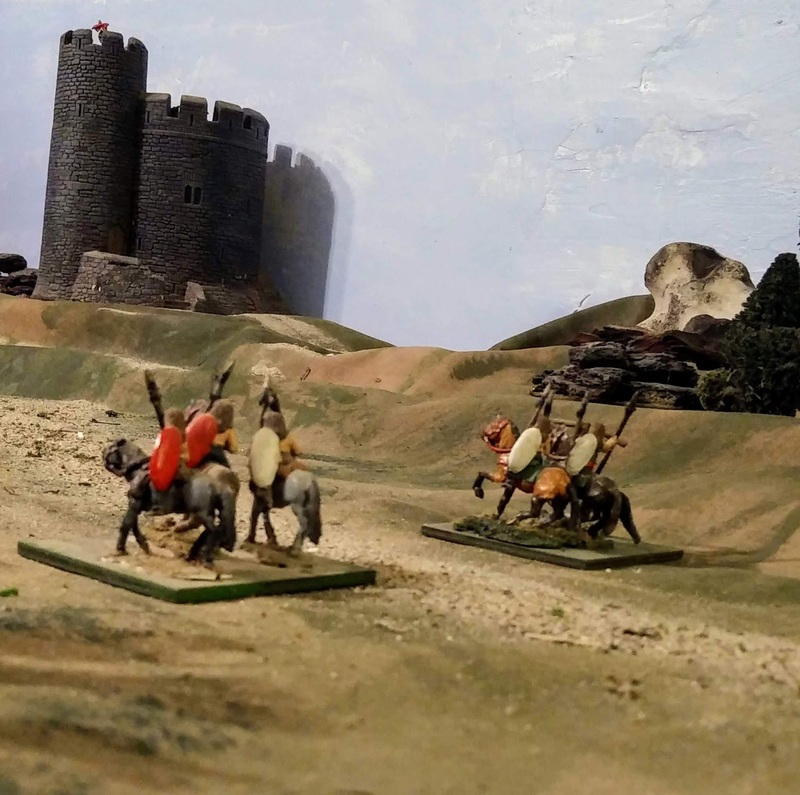 Duke Bedwyr drove his lancers up the hill, screaming a challenge to the Black Knight who spurred to meet him. Moments later the Duke was cut down and his men scattered. 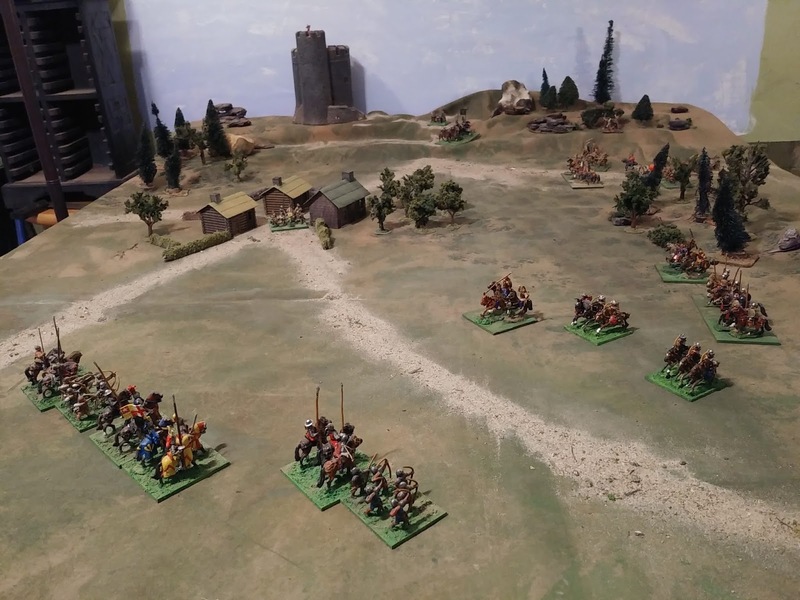 Taking advantage of the confusion, the remaining Valdurian tribesmen slipped past the tower and headed for home while the remaining horsemen scattered and headed west before the Midlish forces could organize a pursuit. For the convoy though, there was no escape and the local archers cautiously approached with an eye to 'securing' the goods. Alas for the North, all the survivors brought back from the Duke's Raid were sad songs and heroic tales. "In the Shadow of the Black Tower". For background please refer to the Legendary Lands Glimpsed Through the Mists of Time. This campaign has been more or less on hold for several years despite the occasional game and new unit but I feel the urge to get back to refurbishing old figures, adding a few newer recasts, harmonizing basing and polishing rules, and background material. The figures are OS25mm, a mix of my original (now vintage) figures from the 1970's, some newer recasts and all sorts of strays that have found a place. 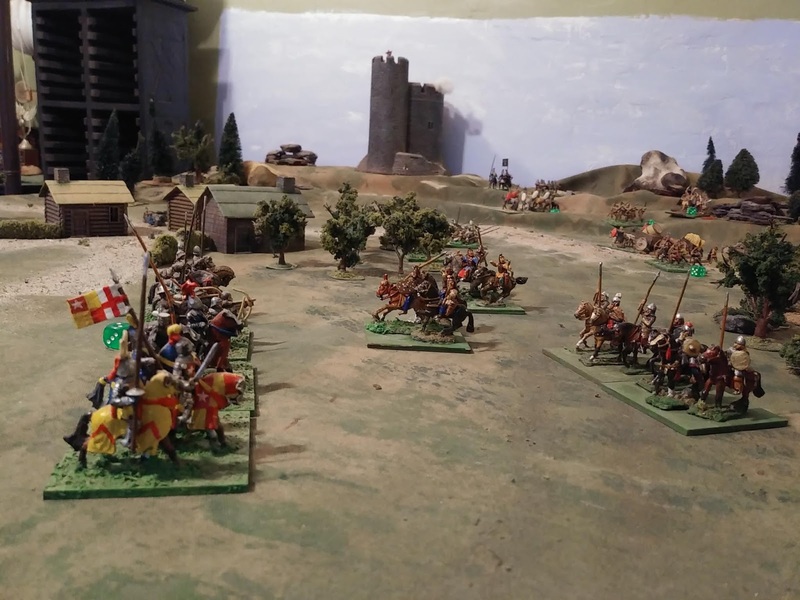 The defenders were led by the Earl of Cowcross, Warden of the West March in the Midlands with a mobile reaction force of cavalry and archers assisted by the Captain of the Black Tower, sometimes called the Black Knight, with his garrison and the veteran local border levies. The raiders were led by Duke Bedwyr. 3 carts or equivalent with guards. The raiders, under the command of Duke Bedwyr may exit the Western table edge (left on the pictures) or the pass (far end of the table) however the baggage train may only exit through the pass. 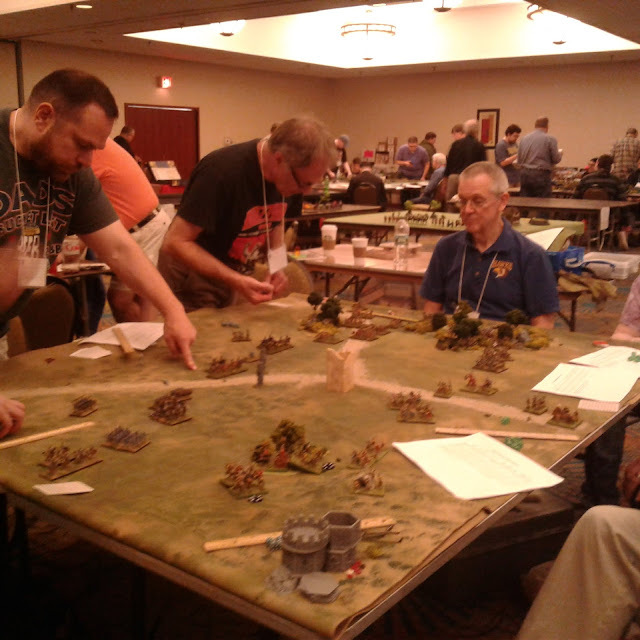 The rules are the latest version of Gathering of Hosts. This is a set of home grown rules developed from Rough Wooing, a Morschauser inspired set of 16thC rules developed by Rob Dean and I in 2002. Each stand is a unit, with units being grouped into "Battles" each assigned to a card. Turn sequence is determined by shuffling the deck then pulling one at a time with that group of units resolving moving, shooting and combat before the next card is drawn. Movement is variable length. A "Battle" that loses over 1/2 of its stands is essentially out of the battle. When one side concedes or runs out of "battle"s the game is over. After much experimentation I am now happy with the basic form of the rules and need to work on adding more details, troop types and so on not to mention explanations. In response to the Midlish raid over the mountains, (see here) the Northern Federation eventually mounted a series of retaliatory raids. 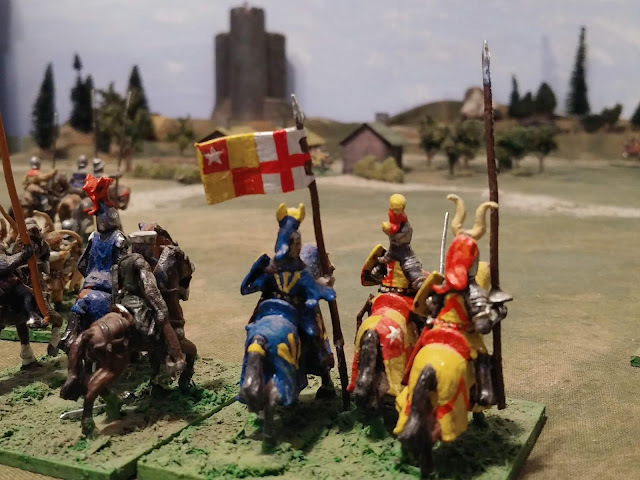 Valdurian Scouts approaching the Black Tower. Slipping raiders across the long border was rarely difficult. Getting them home was harder, getting them home with loot harder again! 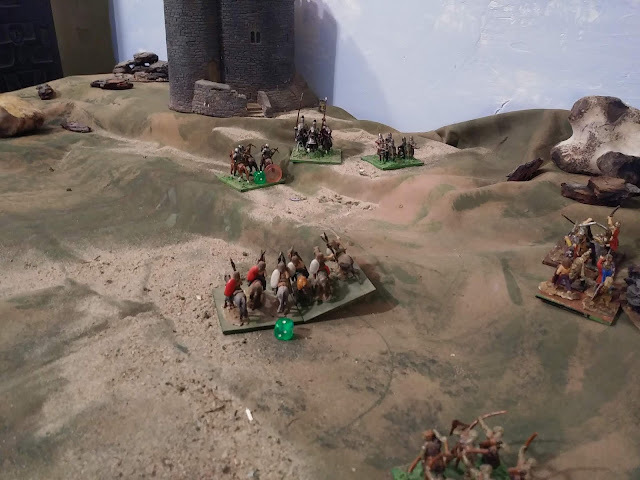 A Midlish relief column approaches the Black Tower from the south as the Northern raiders appear on their way home. What happens next? We'll know soon enough. A few years ago this vignette was one of several RAFM sets that I couldn't resist as long as I was ordering... something or other. Now they are painted. 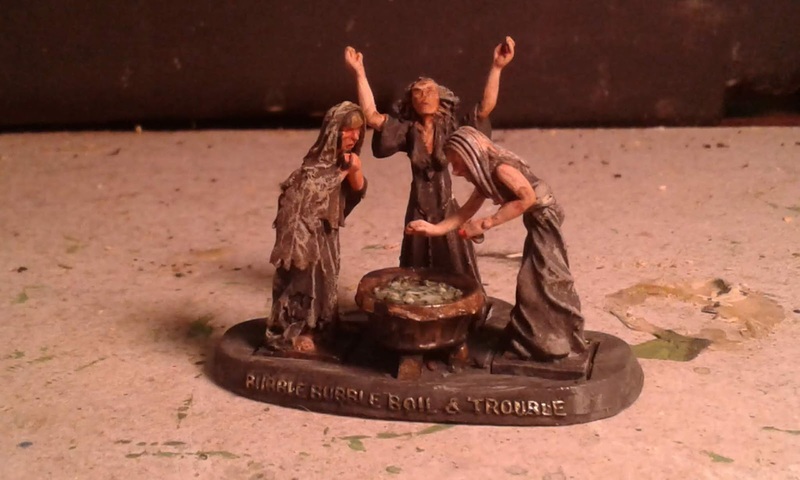 Haven't decided yet if they should be gloss varnished and added to the People of the Forests host or not. As I feared, after 2 multi-player games and having watched a multi-player Viking vs Saxon Lion Rampant game, the rules weren't as bad as they appeared in my solo games. I'm not tempted to adopt them but I'd be willing to play if the occasion presented itself. My Men of the Sea gave a good account of themselves but the poor Black Cauldron force were pushed aside and demolished by heavy cavalry on both games. Their deadliest enemy! Right! 1/72nd fantasy interlude over, time to brush the dust off some 25mm's. Battlegame of the Month. My main blog.